Now readers of this blog know what I think about blowing up bad guys who are terrorists–even American citizens on the field of battle such as Anwar al Awlaki and Samir Khan. Read that here. 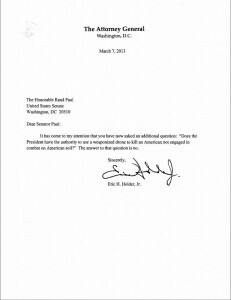 But Paul is right to demand an answer from this White House to his principled question. By so doing, he’s telling these guys that their weasel worded responses will not pass his smell test. This is what you have to do to this White House. John Boehner has (so far ) out waited Barack Obama on the sequester deal and the President’s approval numbers have plummeted as a result. The Republicans called the President’s bluff and he blinked. When you take a stand on principle, the President crumbles. There’s no down side to this! Republicans, this is what leadership can look like. Stand on principle, go directly to the people, make your case and watch them follow. People always talk about how they must live within their means and ask why can’t the federal government. The group Debt Limit USA has put out an ad which demonstrates what it would be like if a family spent like the government. This.Is.Wonderful.